I imagined that last line? Just dreamt it up in one soup-craving-inducing-acid-flashback one night? I’ve never done (dropped??) acid. But if I had….you know I’d be the only person in the history of the universe whose hallucinations would tell her to eat more vegetables. If you have anything against all this soup. If you’re getting bored of it. If you think it’s kinda weird/strange/unusual that someone so against drinking calories…drinks them nightly in the form of blended carrot tahini mush heaven. Then you should probably speak now. Or forever hold your peace. Bonus. If we drink this soup every day from now until then…we’ll be (a) bikini ready and (b) a lovely shade of orange bronze. Self tanning, the natural, cancer-fighting way. I love it. In all seriousness, I’ve been making it a goal to eat either a soup or salad once a day, every day. 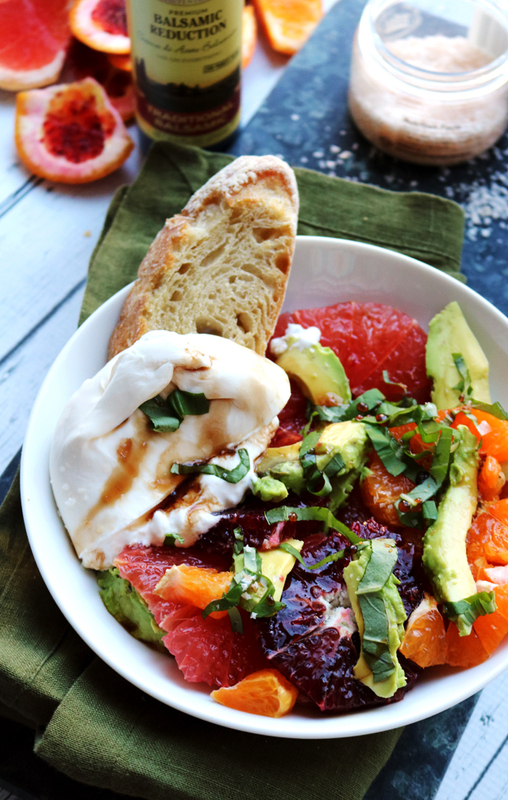 Because when you have a huge bowl of health as a third of your daily eats…only good things can happen. Scientific fact. This soup is a new favorite. Melissa Clark, whose recipe it is, gets it right just about every time, but this really is exceptional. Sweet, nutty, with just a hint of spice. It’s an addiction in a bowl. No recreational drug flashbacks necessary. A soup worth writing home about, this carrot and tahini soup is filled with rich nutty flavor. In a soup pot, over medium heat, pour in oil, then add leek and saute until translucent, about 4 minutes. Add garlic, salt, pepper, coriander, turmeric, and cayenne, and cook until garlic is fragrant, about 1 minute. Add carrots and stir to coat them with leek mixture. Cook, stirring, for 3 minutes, then add broth, thyme, and 2 cups water. Bring to a simmer, partly cover, and cook until carrots are tender, about 25 minutes. When carrots are tender, remove thyme branches and stir in tahini. Using an immersion blender (or transfer to a food processor/blender), puree soup until smooth. Return to pot and reheat if necessary. Taste and add lemon juice. Add salt to taste. I am submitting this to Deb of Kahakai Kitchen for Souper Sundays and also to Chaya’s Meatless Mondays! this does look like a great way to eat/drink your nutrients! Oh, I’m thinking this is definitely my brand of self-tanner – I like it! 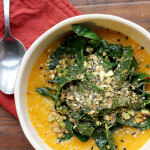 I am a big carrot tahini dressing fan so I am sure I will love this soup. It looks amazing. I did know a wardrobe stylist back in the 80’s who ate too many carrots and her fingers turned orange. 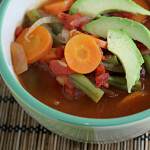 I love eating vegetables in all forms, but eating them via soup is one of my favorites! 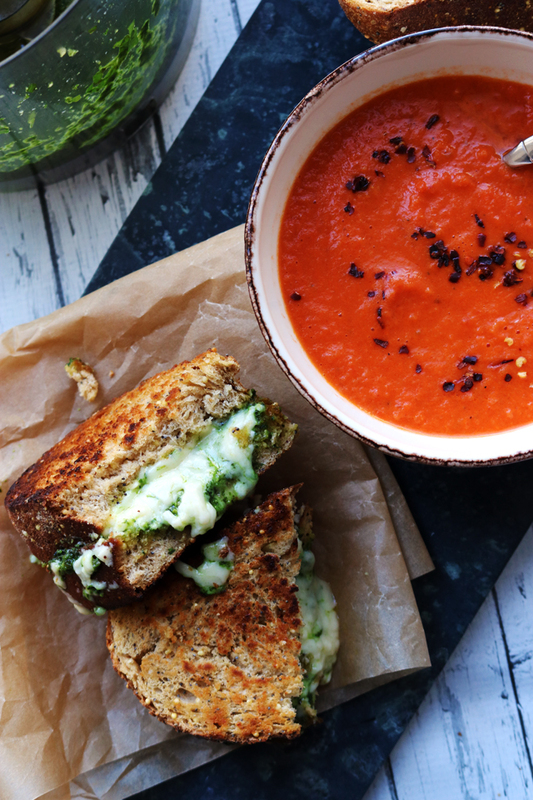 This looks so wonderfully hearty and just perfect for a wintery day! I love the combination of carrot and tahini. Love this soup, and it’s a great use for that perpetual half jar of tahini that’a always in the fridge! I have not eaten nearly enough soup this winter, mostly because I’ve been way too lazy to make a pot even though it is so easy. This should be on my menu soon! Oh and pumpkin/carrot-induced tan is the best kind! I love your suggestion to have a soup or salad every day. This soup looks amazing! This looks great and I have a bunch of carrots from the farmer’s market to use this week. Thanks! HA! You crack me up. I too enjoy soup, and could probably eat it almost every day. I have a really good recipe that I’m going to be posting at some point. I think you’ll really love it. Love the soup + the bowl!! I need soup in my life at least on a weekly basis. And I’ve never seen tahini in soup – I love it! I think that carrot tahini mush sounds awesome! My kind of soup! bookmarked for winter!! Tahini is so good for our body! In Greece we also have a spread with tahini and cocoa and my son loves it! It is far better than the nutella! The soup looks delicious Joanne! Perfect for this time of year! I love carrot and tahini. Have you ever been to Dojo somewhere near Bleecker St (?) Veg restaurant and they have an awesome carrot tahini dressing. I love mushy soup! Great idea to eat soup/salad every day. a yummy bowl of self tanner, love it!! Oh that color, Joanne. I can’t quite envision tahini and carrots, but if you say so…..
Could never ever have enough soup, I love it. This one looks amazing, especially with pita’s to dunk! So many spices and great flavors in this soup! Sounds very comforting for a chilly day like today! i would never think to put tahini in a soup, but i bet it adds so much depth and flavor, delicious! i love soup too. I could eat or drink soup everyday and this one looks and sounds quite interesting. I like the tahini. Cool. While you make it a goal to eat soup every day, I’m trying to not eat cookies for breakfast. Let’s meet back here in another week and see how we’re doing, k? ooooh, you’ve totally inspired me to do something with the gigantic head of cauliflower in my fridge. cauliflower tahini soup? whaddya say? Tahini in a soup! Will the wonders never cease. That’s such a great idea. And we just bought 5 lbs of carrots on Sunday by the way–I’m starting to juice every morning. Though the whole ‘bronzed’ thing–I doubt even overdosing on carrots could get me there. I love the flavor combo here. Not crazy at all, just yummy. Nice one Joanne. 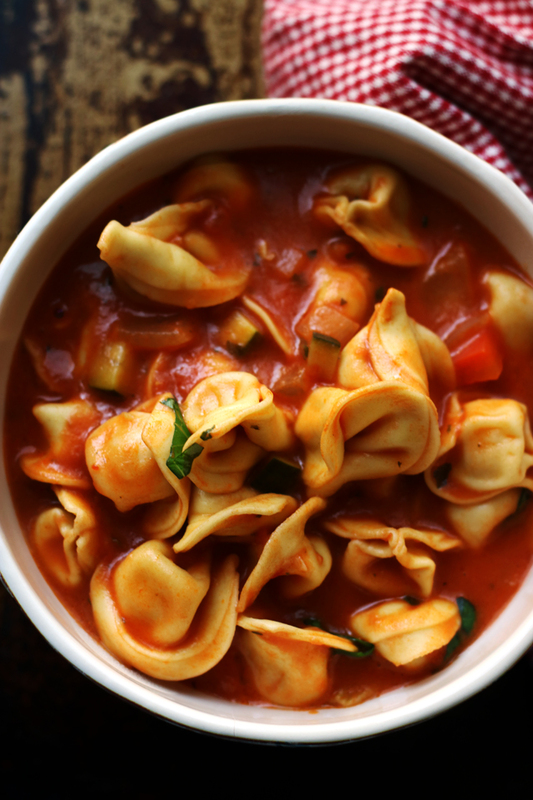 This soup looks like perfection! Tahini in a soup? Oh, yeah! 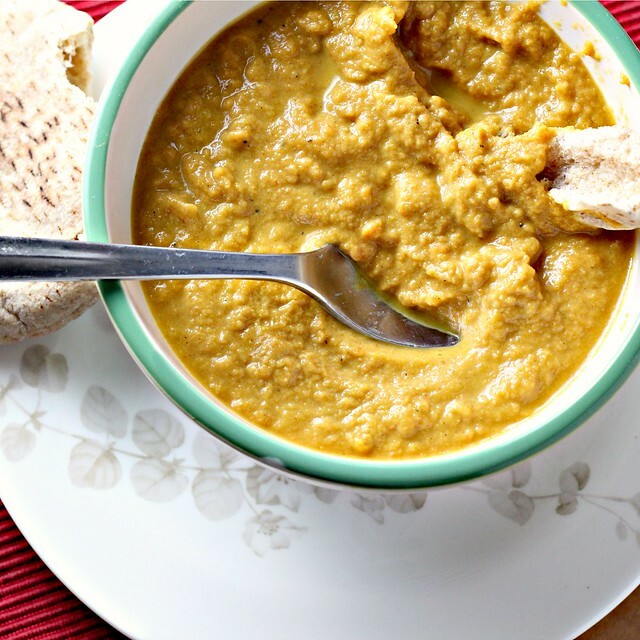 I have never tried adding tahini to a soup before-wonderful idea! 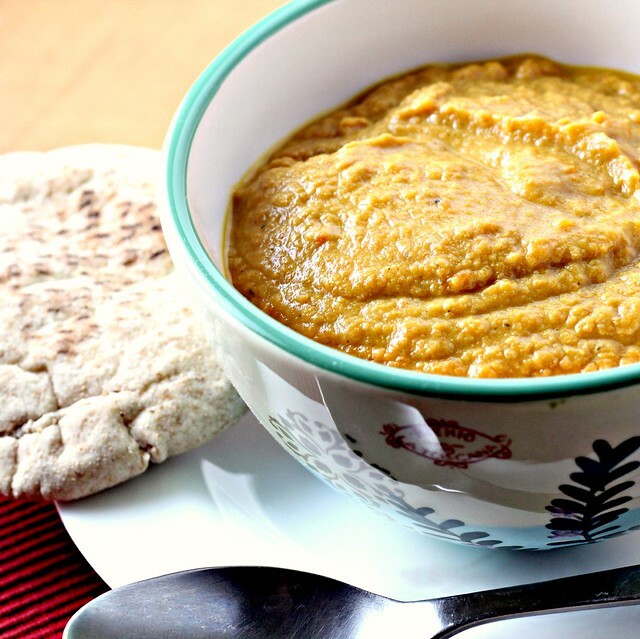 I bet the tahini pairs perfectly with carrots in this hearty soup. What a lovely looking soup, Joanne. It looks so hearty and comforting, and just delicious! Thanks for sharing your simple recipe and lovely photos. If I didn’t have a valentine I would totally ask you to be mine. And you would have to bring the soup. That looks and sounds wonderful. I’m so trying that. Great flavor combination and perfect for the rainy day that i am facing today! I love this take on carrot soup! And also love your idea to have soup or salad for a meal at least once a day. I love the soup….it looks delicious and comforting! I am a huge soup fan and this one is going on my list! My friend and I were just talking about how we want to find more entrees with tahini and thsi answered our very desires! And as for the Michael Pollan quote…I couldn’t agree more. 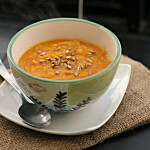 LOVING soup recipes, especially now that winter has come full force! Love the use of tahini in here, it definitely makes everything better! I will never tire of your soups. Never, ever, ever. This is such a thick satisfying soup! Your ‘soup or salad a day’ motto is a good one. Just wish I could stick to it. This soup looks fantastic, and I bet it tastes good, too. 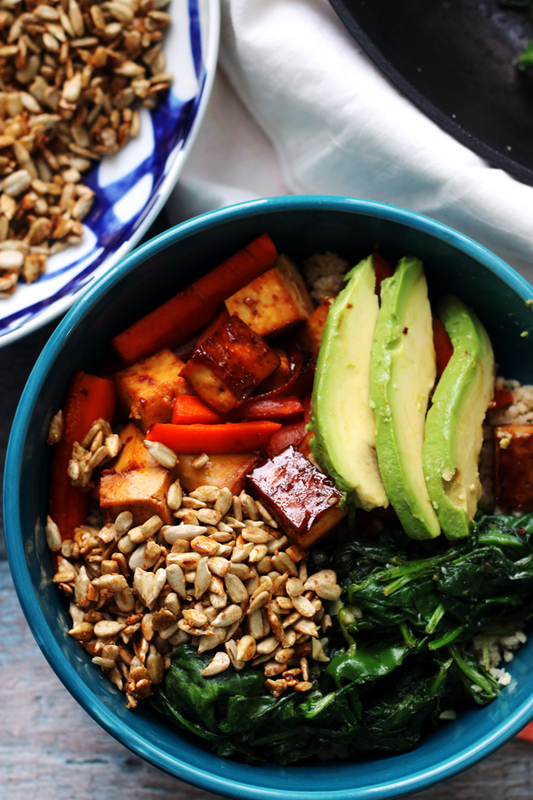 Now that’s a bowl of delicious and hearty warmth! You’ll get no soup objections here. We love soup and tonight, we’re just having a big chopped salad and feta for dinner. So interesting this dish…carrot, tahini and lots of spices…sounds and looks awesome Joanne. You always make me hungry for something healthy. I’ve got to try this soup. It looks like it would freeze really nicely! see now i know why i like you so much; you make all your soups thick. to me, that is how it should be done. broth soups are not soups, they are broth. Yes! A new use for that massive jar of tahini I have. That stuff goes a long way when only making hummus. I’m pretty sure I read that last line about soup too. Or was it cake….? Believe it or not, I made this NYT recipe before my blogging days. I remember thinking it was delicious…. thank you for reminding me! What a great goal! I want to start that too :). You make the best soups, wonderful recipe! I can never tire of your soups! Your vegetable-and-flavor-laden-so-good-for-you-and-delicious-too soups! I’m going to adapt your soup or salad a day rule for myself. It’s perfect. This looks delicious, can’t wait to try it. Love carrots. Is there a particular brand of tahini you prefer? I never get tired of eating soup. I think this soup looks like a bowl full of heaven. Tahini in soup..please sign me in, Joanne! Love..love..the recipe. Hee Hee. You are funny. And that soup sounds delicious. Wow. The recipe seems amazing. I would try it. Thanks for sharing. That is just a big bowl of goodness right there. 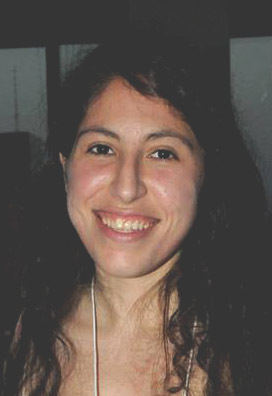 That Melissa Clark can do no wrong! I find it hard to ‘get into’ soup but this sounds so where my brain is at – but then anything with tahini in it allures me no end. And I do like the idea of eating a soup or salad at least once a day. This soup looks so healthy and tasty. I’ve never used tahini in a soup, but it sounds great! 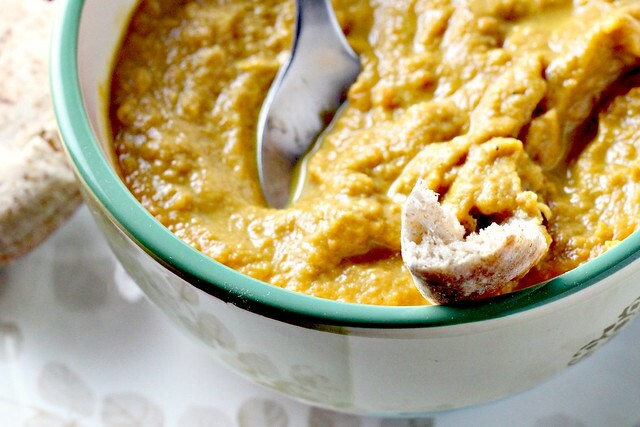 Tahini in a soup: awesome! I love it 🙂 I like the idea of eating a soup or salad once a day as well, I think I’ll pick that up! A healthy and delicious recipe!! I am so glad we both have a soup addiction. It made it to my mealplan twice this week. I like it! I have a jar of tahini in my fridge that doesn’t get much action. This would be a perfect recipe. wow, that looks super delicious. 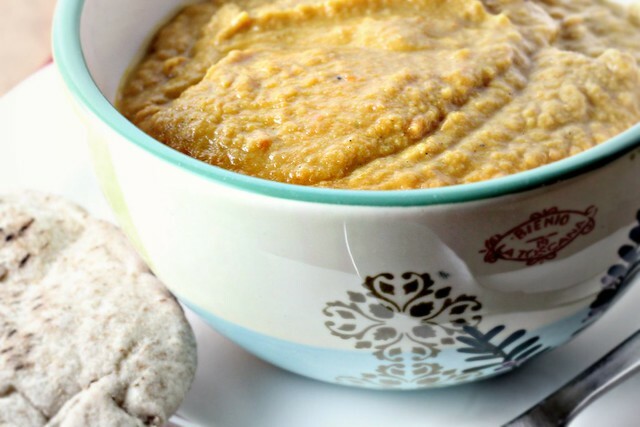 I love both carrot and tahini flavor, so to have them together in a soup sounds wonderful. Love this soup! Comforting, filling and healthy. Would love to make this. Soup is the nectar of the gods. If it is 100 degrees out, I will still happily slurp soup. My first soup with tahini! Yes! Love that I now have another use for the tahini in my pantry! Genius! an odd combo that sounds pretty darn good … and easy to make … you speaky my language! Since you haven’t had LSD, that wasn’t a “flash back” it was a “flash forward” ha ha. This won’t get my body bikini ready (’cause I ain’t wearing one this summer) but it sure would make my mouth happy. So rich and thick! I love the idea of this soup. 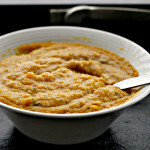 I often find carrot soup a bit too sweet but I imagine the tahini balances it out nicely. It looks lovely and thick too. Made this tonight and I love it!! Thanks for sharing it, Joanne! I made this earlier this week and have just posted about it on my blog. Hope that’s ok. It was really delicious and has already inspired me to experiment with another tahini soup too!